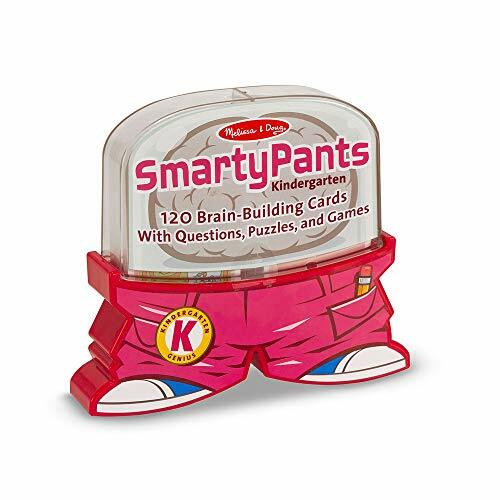 Amazon has the Melissa & Doug Smarty Pants Kindergarten Card Set, Trivia Games, Educational Card Set for Kids, Developed with Educators, 120 Cards, 6.25” H x 7” W x 1.25” L marked down to $8.99 with free shipping! EDUCATIONAL CARD SET FOR KINDERGARTNERS: The Melissa & Doug Smarty Pants Kindergarten Card Set includes illustrated activities like picture puzzles, math challenges, tongue-twisters, mazes, vocabulary builders, and more. DEVELOPED WITH EDUCATORS: Our educational toys have been developed with the input of educators to support the curriculum of each grade level. WHIMSICAL DESIGN: Melissa & Doug learning games are created with a whimsical design and lighthearted tone to inspire kids to become excited about learning. Each set contains 120 cards, with multiple questions and activities on each of them. GIFT FOR AGES 5 TO 7 YEARS: The Kindergarten Card Set makes a great gift for kids 5 to 7 years. Add the Melissa & Doug Classic Card Games Set to round out the hands-on play experience and give kids another engaging option for screen-free fun.